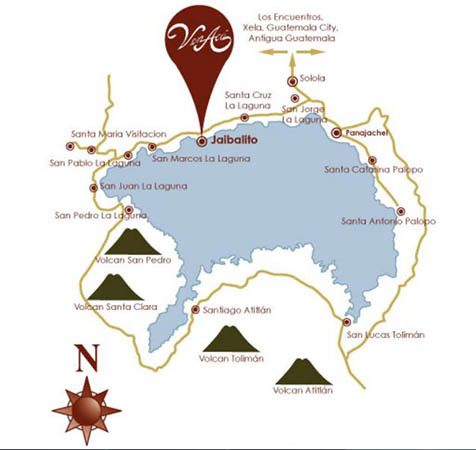 As you can see from the map, our town of Panajachel on Lake Atitlan is a short boat ride to Jaibalito (pronounced High-bah-LEE-toh). We have a favored restaurant there that serves scrumptious food, has an outstanding view and also provides access to an infinity pool and hot tub. That restaurant is Club Ven Aca. 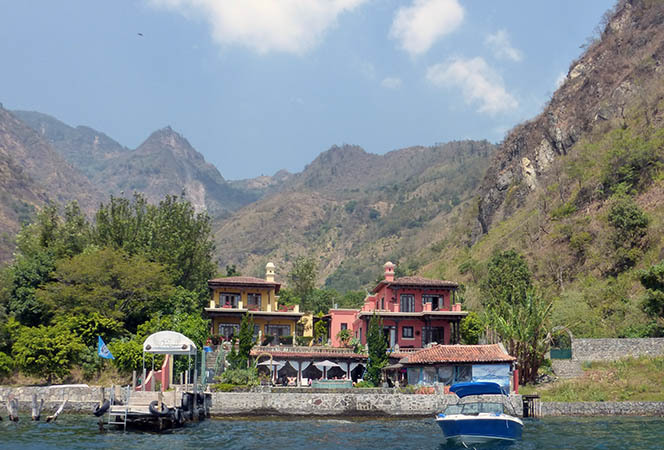 The cost of a boat ride from Panajachel to Jaibalito is 10Quetzales or about $1.25USD. It only takes about 15 minutes on the lake to reach the town, but one has to wait for the boat to fill up with about 12 people before the Captain will leave. That could add another 15 minutes or so to your trip. 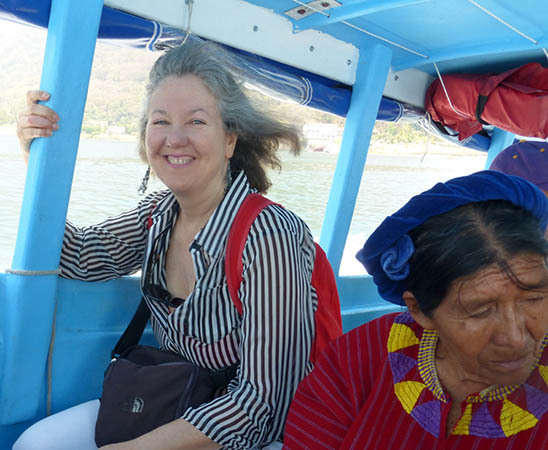 The only way to reach Club Ven Aca is by boat to their private dock or by footpath from the main dock in Jaibalito. It's a very secluded place. Club Ven Aca also used to be a hotel with the villas you see here rented out. Now, these villas are privately owned. 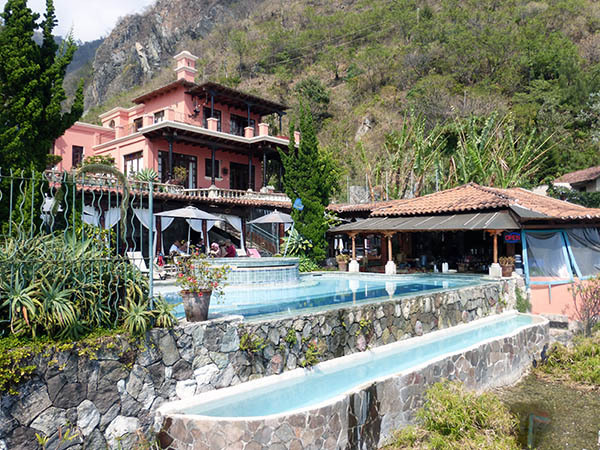 Ven Aca has a bar, a hot tub and infinity pool all for the use of patrons to the restaurant and for those who own the villas in the background. It is a lovely garden setting with a wrought iron gate entrance from the dock. The most comprehensive guide to Panajachel ever! Here you see the twin peaks of the volcano Atitlan with the volcano Toliman behind it. The lake itself is one of the deepest lakes in the world at over 1,000 feet. 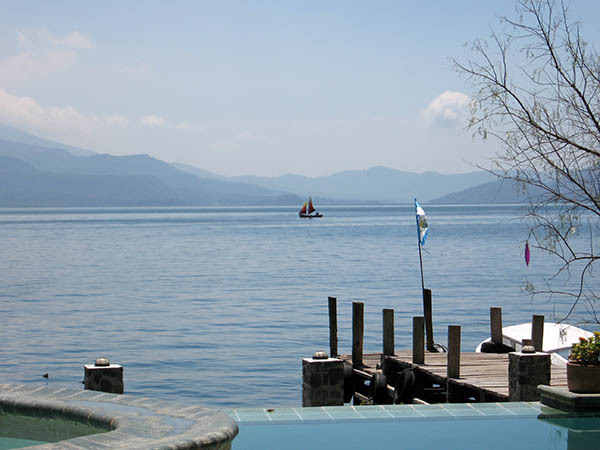 Lake Atitlan is considered to be a sacred site in Maya mythology. 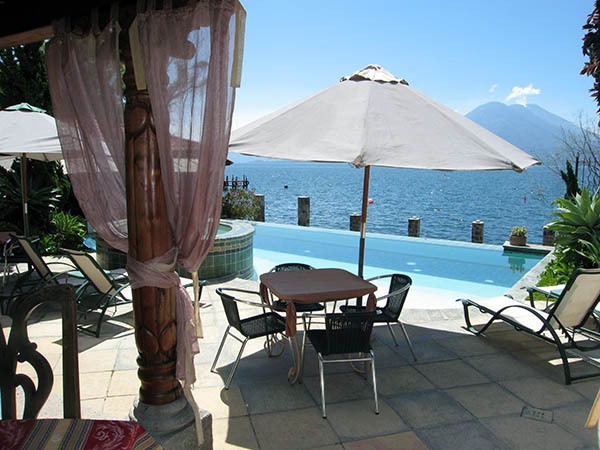 Brave New World author, Aldous Huxley, compared Lake Atitlan to Lake Como in Italy, and was quite taken with its beauty. For centuries, the Maya have lived here in over a dozen lakeside villages. The natives are of Kakchiquel and Tz'utujil descent whose roots stem back to the ancient Maya, rulers of Mesoamerica before the arrival of the Spaniards. The indigenous inhabitants still maintain the customs and traditions of their ancestors and the women are weavers of the highest grade. 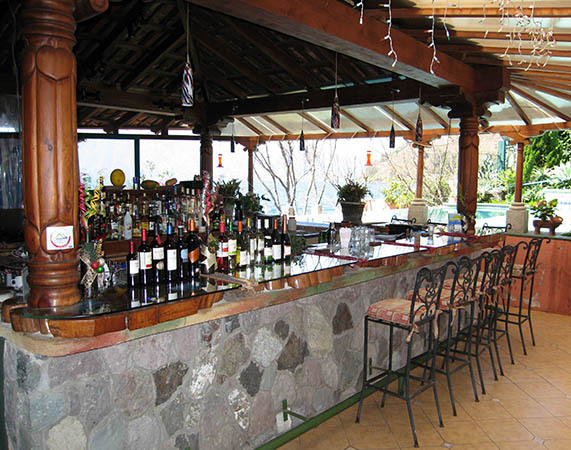 The bar offers a thoughtful wine list, mixed drinks, wine, beer and specialty coffees. 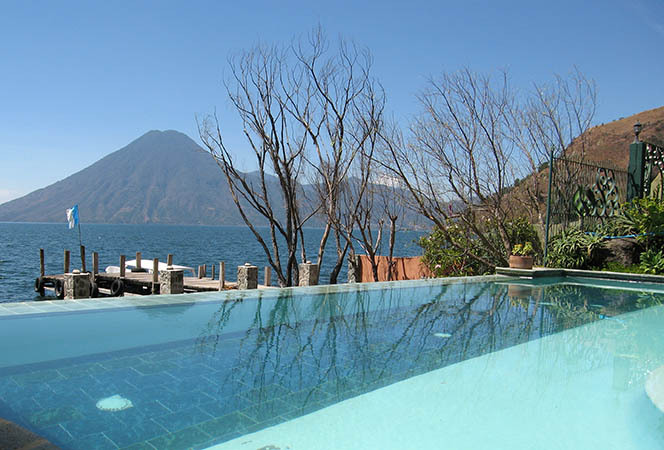 While in the pool, one gets the sense that it joins with the lake all the way to the volcanoes in the distance. Notice the wrought iron gate to the right, at the entrance to the restaurant. 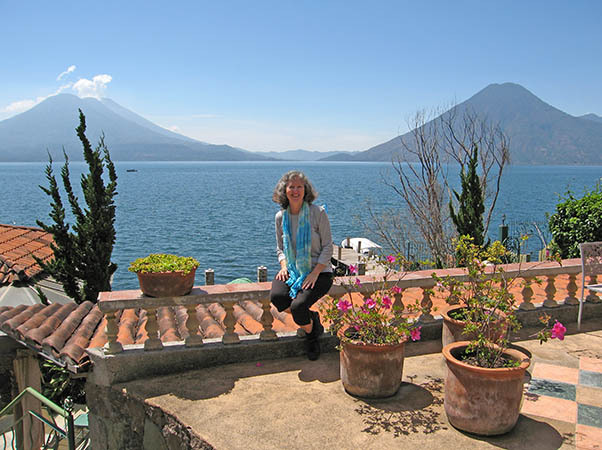 Akaisha sits on the railing in front of the magnificent lake, with Volcan Atitlan in front to the left, Volcan Toliman behind. To the right is Volcan San Pedro. 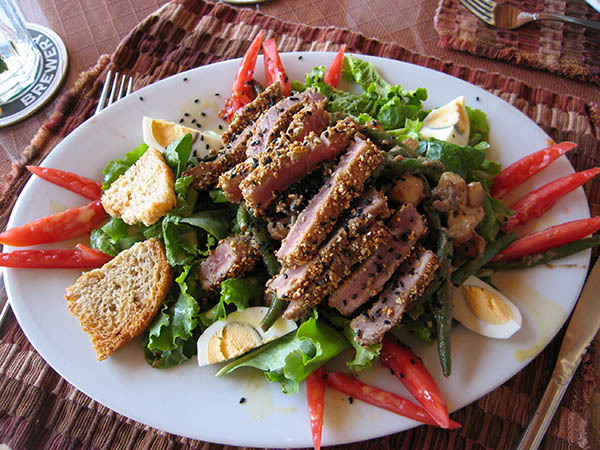 This salad was delicious and so fresh! The vinaigrette was gentle yet tasty. 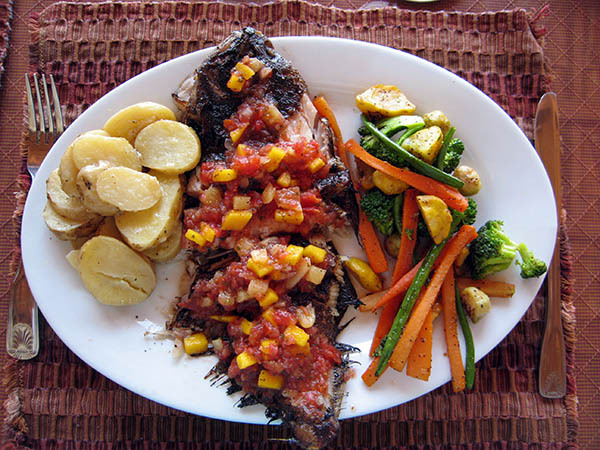 In many countries, fish is served whole on the plate. Unless the menu says "filet of fish" one should expect it to be served skin on and bones in. The vegetables were fresh, the potatoes had a light cheese covering and mango salsa topped the fresh flounder. After our meal, we went down to the private dock and waited for a ride back to Pana. Boat shuttle service operates all day long about every 30 minutes. One just needs to stand out on the dock and wave a lancha in. What a great way to spend an afternoon!